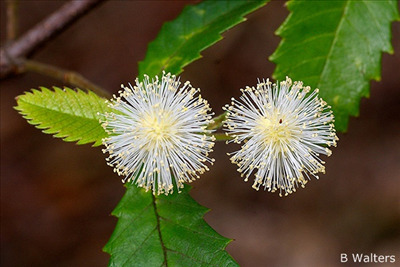 An attractive fast growing shrub or small tree with dark brown, rough bark and a pinkish-brown inner layer. It has creamy yellow round flower heads that appear in spring to early summer. The new growth is a pale bronze which is attractive. It grows naturally in moist areas in rainforest gullies in Eastern Australia. Excellent for gardens with plenty of water and can also tolerate humidity. This is the only species in the genus confined to Australia. Propagation Information: Grown by fresh seed or by cuttings.